“I like the Yelp (iPhone) App…, but if I’m going to spend $400 of my own money on dinner, I want to talk to a grown up” – Parsons in response to audience asking the panel what they think is the future of restaurant critics. If you know me, you know I like my wine. By this point in the day, I was a little tired (it’s siesta time somewhere, right? ), but was eager to hear from all the local winemakers on the subject of Mighty Wines: Small Family Producers Using Traditional Winemaking Methods. I love that they had female winemaker, Karen Steinwachs from Buttonwood Winery representing. Her goal? To make their wine as famous as their peaches. I can’t say I’ve ever had a Buttonwood Peach, but now I really want one! Steinwach’s wine motto? “Crush grapes, put it in the barrel, let it speak for itself. ” Love it! Gary Paul Nabhan closed out the day. I felt for him, since by this time it was 4:30 and most of us had been there since 7:30am. I’m not used to sitting in a “classroom” for so long and was feeling it in my bones. But like all the speakers, the minute they started talking, everyone was paying full attention. Nabhan began by saying he had doubts that we are going to make major changes to food policy at the federal level. Instead, he encouraged his audience to start local and get support for something that is already working. Nabhan used The Greening of Detroit (see my recap on this in Part 1) as an example of a success story that could be used to guide policy change. He asked us to find our” sweet spot” and determine where we as individuals could make the most impact. I’m hoping that Be Food Smart is my special role. Stop for a minute and ask yourself, “what’s my sweet spot? How can I make an impact?” I loved Nabhan’s example of Joan Gussow’s sweet spot (Gussow was the keynote speaker – see Part 1): “She can be that curmudgeon that keeps us honest.” He ended his message by reading the touching and thought provoking, A Terroir-ist’s Manifesto. My friend Jeanine and I decided to hit up Brophy Brothers for a quick snack while we waited for the gala event to begin. 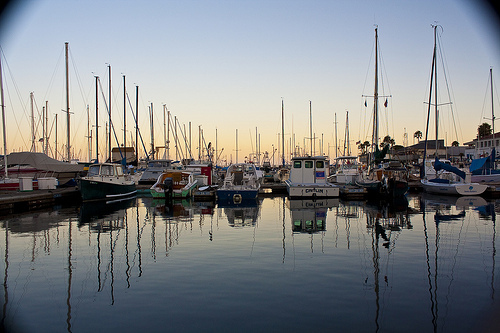 Sunset overlooking the Santa Barbara Harbor is not something to be missed. Stunning. My already incredible day ended with a downright fabulous gala at the Santa Barbara Maritime Museum. The room was filled with sumptuous, locally sourced food bites, Organic Soup Kitchen’s coconut-yam soup, an overwhelming selection of Santa Barbara wine, brown and white Telegraph beer, St-Germain cocktails with beet foam (yes, BEET foam – think frothy & pink), and dessert. Wait, did I mention dessert? Let’s see, there was homemade almond gelato, meringues, vanilla creme pots, lavender sorbet, caramel de sel chocolates. This is my version of heaven. It was so cool to see a zero waste party where all the food was served on VerTerra‘s new, compostable dinnerware (it’s stunningly beautiful, seriously, check this stuff out for your next party. I’ll post pics soon.) and wine out of actual glass stemware. GreenProject Consultants sponsored the event’s waste management and had “compost police” strategically placed at every bin. Talk about putting your money where your mouth is (extra pun intended)! I walked out of the building into the crisp evening air feeling both physically and mentally satiated. What do elderflowers, heirloom beans, blogging, and branding have in common? Stay tuned for part 3 of my Edible Institute Experience.